Representatives of the Red Sox told the Boston Licensing Board last week that the team wants the right to sell mixed drinks, in addition to beer, “at a limited number of stations’’ throughout the 37,000-seat stadium and on Yawkey Way. Currently, hard liquor is available mainly at refreshment stands serving fans with upper-level premium seats. The proposal appeared to surprise Boston police and a representative of the mayor, prompting the three-member board to postpone a vote until after a second hearing, scheduled for next Wednesday. Typical Bostonian snobbery, ain't that right Tawmmy? What's the worst that can happen, you fall off the back of the Monstah again? Not to side with the government on this one, but my guess is that most of the cheap seat owners could blow a .18 before stepping foot inside Fenway. But later in the article, it says that the mixed drinks won't contain any more alcohol than the beer sold there. That's just nonsense. If I'm going to try to fight Gary Sheffield again, I'll just stick with my flask of moonshine, thank you. Offbase editors Derwood Morris and MTD haven't had much luck previewing things lately-MTD incorrectly predicted Gary Discarcina would come out of retirement to help the Angels win the 2009 World Series and Derwood thought Teen Wolf 3 would be the 2010 summer blockbuster. But here are division previews anyway. Today I preview the AL Central because my boy Mike at The Golden Sombrero doesn't respond to text messages anymore. Jerk. The White Sox picked up Adam Dunn's Three True Outcomes to DH for a pretty good lineup provided Paul Konerko, Alex Rios and Carlos Quentin don't completely collapse on themselves. Somebody better knock on wood. The good news is Gordan Beckham can't possibly be as bad as he was in 2010. Unless he's been studying the Brandon Wood handbook to future unemployment. Remember when Jake Peavy was a great pitcher? No, seriously, I really want to know. Somebody look that up for me. I'm fascinated by the Twins. Justin Morneau won an MVP that he didn't deserve in 2006 but was well on his way to an MVP season last year before a concussion derailed his second half. I blame that on pee-wee hockey and Canada. Joe Nathan missed the entire season and Joe Mauer went back to not hitting for power. And then Carl Pavano pitched like he belonged in Major League Baseball and they won 94 games. My Off Base prediction for the Twins is that Tsuyoshi Nishioka will hit .387 in 2011 and then .116 in 2012 but they'll still make the playoffs thanks to Gardy's willingness to sac bunt in the first inning. Miguel Cabrera had another offseason bout with alcohol and is projected to have another 35+ home run season. There's something to be said about consistency. Austin Jackson's BABIP and OBP should regress in a big way leaving Cabrera and Victor Martinez as the only Major League bats in the lineup. Quick, name a starter other than Fausto Carmona. Shin-Soo Choo is pretty much the bright spot for the Indians until Carlos Santana is fully healthy from his season ending injury in his rookie year. Grady Sizemore is still trying to get his once-bright career back on track after being derailed by injuries. Here's to hoping Grady can play at a high level again and keeps his clothes on. The Royals farm system is loaded. 2011 begins their journey toward World Series Championship contention...in 2015. Today we take a crack at the NL Central, home of the Pirates, and five other teams. The Red Stockings won the division last season and then pulled a 1998/1999 Texas Rangers against the Phillies in the division series. Joey Votto had a monster 2010 and won the NL MVP, but really the guy's been fantastic since he broke in during the 2007 season (162-game average: .314/.401/.557, 151 OPS+). The Reds led the NL in runs scored a year ago and have some of the best young pitching in the big leagues, namely Travis Wood, Johnny Cueto and Aroldis Chapman. Things on the roster that aren't young: Edgar Renteria, Miguel Cairo, Scott Rolen. The Cubs parted ways with Carlos Silva and the other man living underneath Carlos Silva's shirt when both were released a few days ago. Once Ted Lilly was traded to Los Angeles on the trade deadline last July, Silva became the Cubs' best starter, but now a number of people will be trying to grab that title. 1. Carlos Zambrano. The rooster in Carlos Zambrano's ear reported Carlos Zambrano is 4% less crazy, but there's a 100% chance that percentage goes down a few minutes after Chicago's season begins. 2. Ryan Dempster. Had a monster 2008 season and got paid for it (3-year, $38 million contract through '11), but fell off a bit in '09 and '10. He'll get the opening day start for the Cubbies, and if you believe morons, that means certain HOF entry for the right-hander if he keeps getting those types of assignments. 3. Matt Garza. Was traded from Tampa Bay after consecutive 200-inning seasons for the Rays. Going from the AL East to a division with the Pirates and Astros has to make a starting pitcher happy. Chicago should have a good bullpen with erratic/electric Carlos Marmol (52 BB, 138 K in 77 2/3 IP) closing, Sean Marshall coming off an excellent season and Kerry Wood back in the red, white and blue for the first time since 2008. Albert Pujols' contract status was a major topic of discussion this past off-season, but what about Nick Punto's contract status?! The Brewers were picked by many to challenge and perhaps win the Central when they traded for right-hander Zach Greinke from KC in December. Greinke was expected to join Yovani Gallardo as an excellent 1-2 punch at the top of the rotation, but that will have to wait. During spring camp, Greinke suffered a cracked rib playing basketball and will start the season on the disabled list. Brewers person: "Hey Zack, we're just thrilled to have you in Milwaukee. By the way, there's plenty of BRATWURST available in this city. I don't know if you were aware that Milwaukee has BRATWURST. Anyway, we think adding you to our rotation gives us a great chance to win. Oh, you'll be making $13.5 million this year. Not all at once! (laughs to himself). Now, if you wouldn't mind playing some basketball, injuring yourself and missing the start of the season, we'd really appreciate it." Milwaukee has a number of other players on the disabled list to open 2011, including terrible pitchers Manny Parra (strained back) and Latroy Hawkins (right shoulder), right fielder Corey Hart (strained oblique) and young catcher Jonathan Lucroy (broken finger). No truth to the rumors that the four were injured during a spirited game of capture the flag. Seems like a long time ago when Houston was playing in its first World Series, but it was only 2005. Since then, the Astros have been close to a .500 team (391-418) and haven't finished higher than third in the Central. This is the fifth year of Carlos Lee's six-year, $100 million contract and so far he's unofficially earned $63,491 of it. Maybe the franchise should change its name back to the Alleghenys, or bring back Bobby Bonilla to coach first base. Put a Pirates hat on a chimpanzee and have it play third. Try something, because whatever they've been doing in Pittsburgh hasn't been working. The Bucs haven't had a winning season since 1992 (18 consecutive under .500), and there's nothing to suggest that streak won't be extended to 19. The Pirates have some good, young talent in Pedro Alvarez, Andrew McCutchen and Neil Walker, but if Kevin Correia, he of the -1.8 WAR for San Diego a year ago, is your opening day starter, then I'm afraid you're in for a Season of Alvaro. Season of Alvaro - Comes from the Latin phrase "Alvaro Espinoza" meaning terrible results expected from April-to-September. Spring Training can be a slow time, and that's when ideas like listing the top catches in baseball movie history happen. 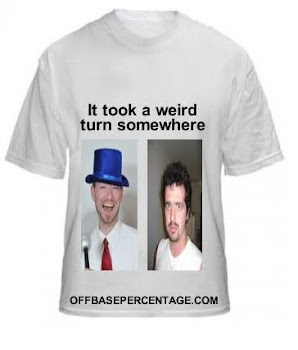 Here is Offbase's top 3. Scott Smalls wasn't supposed to make that catch, you know. He was supposed to get hit in the other eye, another one of Dennis Leary's steaks was supposed to be ruined, and the Smalls family was supposed to be run out of town. But Benjamin Franklin Rodriguez wouldn't hear of it. Benny the Jet urged Smalls to put his glove in the air and the neighborhood legend would "take care of it". Smalls, having just replaced the glove he won in a bowling alley claw machine with one of Benny's old mitts, followed Rodriguez's instructions and the fly ball landed right in the center of the mitt. 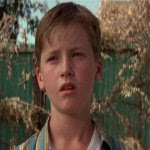 The catch cemented Smalls as not a guy who was banned from the sandlot for life, but as a guy who could bat ninth and hopefully not be a liability in left field. You could say that catch became the routine pop fly heard round the world. We all know the story: Hayes is a non-roster non-invitee-turned-invitee who ends up leading the majors in stolen bases with 273 (unofficial), including a number of steals of home. But his greatest moment comes in the one-game playoff against the Yankees. In a scoreless tie in the sixth, Hayes does his best Otis Nixon impersonation, scaling the Milwaukee County Stadium wall to rob "Williams" of a certain go-ahead home run. Three innings later, Hayes scores from second on the worst bunt in the history of organized baseball. Indians win it, the Indians win it, OH MY GOD the Indians win it. Without Hayes' catch, they may not have. Timmy Lupus was the definition of a bench player. I mean, the kid was behind Ogilvie on the depth chart, for god's sake. But in the championship against the Yankees, Buttermaker had a change-of-vodka and decided to empty the bench. Lupus got the call and headed out to right field. The rest is North Valley League history. A towering fly ball heads out towards Lupus and the frail youngster reaches up and robs the home run. Lupus looks as shocked as anyone as his teammates come rushing out to congratulate him on his F-9. Timothy Lupus: American hero. In this post, I look at the NL West. The West is of course home to the defending strikeout kings of baseball, the Arizona Diamondbacks. And some team that won some series. Obviously, I mean Brian Wilson and not George Lopez who I'm trying to get deported for crimes against comedy. The Rox rewarded their young stars by locking up Troy Tulowitzki and Carlos Gonzalez to monster contracts. CarGo displayed some uncanny home/road splits in 2010 to the tune of .380/.425/.737 and .289/.322/.453 but those home stats still count. Tulo is a fantastic player by all accounts but hasn't displayed a knack for staying healthy. But I'm not on the hook for any of that cash so the next few years look like pretty good deals. PECOTA thinks Ubaldo Jiminez comes back down to his 2009 stats but a tad worse and I'm inclined to believe that based on my scientific whimsy. I think the Dodgers have a better rotation than the Rockies but they did let Russell Martin walk just when it looked like he was poised to give Jeff Mathis some competition for most incompetent LA catcher at the plate. So Mathis can go ahead and get that 2011 acceptance speech ready. Matt Kemp should have a better season unless having dated Rihanna turns out to be some kind of career killer. Which is why I have rejected her many advances. You know, for the sake of the blog. I hear the weather is nice. And a zoo, right? So, that's cool. The Diamondbacks struck out an impressive 1,529 times last year. The Marlins were the next closest with 1,375. The D-Backs shipped off Mark Reynolds who struck out over 200 times for the past three season in an effort to make me stop watching them altogether. Good job, Arizona. You just became less interesting. Enjoy these gems as we count down the hours until baseball returns. Today we take a look at the AL East, a long-ignored division. It's about time these guys got some attention. The wild card winners from a year ago didn't land free agent pitcher Cliff Lee and Andy Pettitte retired, forcing Anthony from Poughkeepsie to nearly overdose on linguine with clam sauce and the Yanks to move Phil Hughes and A.J. Burnett up in the rotation and audition less-desirable options for the Nos. 4 and 5 starters during spring training. The trio of Ivan Nova, Bartolo Colon and Freddy Garcia have been battling through camp for those two spots and it looks like all three will make the opening day roster. It's not clear which two will grab rotation spots, but the Yankees did sign Kevin Millwood to a minor league contract. Sidney Ponson was unavailable for comment. 1. Derek Jeter had a tough 2010 season and is approaching 3,000 hits. I'm not sure if you were aware of those two news items. 1. Will Josh Beckett add another extension cord to his neck in time for neck extension cord season? 2. Did Clay Buchholz pass 10th grade chemistry or what?! 3. Can Tim Wakefield become the first 83-year old in baseball history to allow 10 or more stolen bases in a single game? 4. Is that Oil Can Boyd at Radio Shack? Last year's division winners lost a ton of talent in Crawford, Jason Bartlett (traded to San Diego), Carlos Pena and Matt Garza (both signed with the Cubs) and Rafael Soriano (signed with the Yankees), but there's some good stuff left for no one to see at Tropicana Field. David Price and Evan Longoria are two of the finest young players in the game and Ben Zobrist (.295/.405/.543 in 2009, .238/.346/.353 in 2010) should be able to bounce back. Tampa also reunited Johnny Damon and Manny Ramirez, though league rules don't allow a team to DH two players at once, so one of the two will have to play left field some days. After Price, the pitching is thin as When's The Last Time I Pitched Big In A Big Game James Shields got lit up a year ago and Jeff Niemann will need to improve on his decent 2010 numbers. The bullpen was one of the best in the game in 2010, but is now missing Soriano. Lefty Randy Choate, now with the Marlins, appeared in 85 games last season and amazingly, Joe Torre was not his manager. Either way, Choate is in Florida, so those 85 games will have to go to someone else. For all three Rays fans' sake, hopefully not to Kyle Farnsworth. 1. If you're going to start babbling nonsense, start a baseball blog, like we did. That way you won't have to backtrack and look like an idiot. 2. Climb above fifth place and then maybe you can take unnecessary shots at the faces of the top two franchises in the division. So, in other words, we'll talk in 2018. In this episode, I tackle the AL West because I own a J.T. Snow California Angels jersey. The Rangers rode Cliff Lee and C.J. Wilson to the World Series only to fall to blog favorite Buster Posey, Brian Wilson's beard and the rest of the Giants. But I hear they did receive some pretty sweet little plastic runner-up trophies. 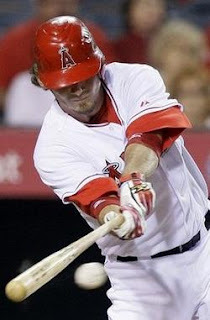 Josh Hamilton rightfully won his first MVP despite missing the last month of the regular season. Hamilton should be healthy for some of 2011 along with Ian Kinsler and Nelson Cruz. They let Vlad Guerrero walk after a resurgent 2010 season but added Adrian Beltre at third base and will slide Michael Young to DH. The loss of Cliff Lee is an obvious blow to the rotation and the "moving Neftali Feliz to starter" experiment ended last week. I still expect the Rangers to repeat atop the West unless injuries wipe out too many wins. Oakland relied on their pitching staff for their 2010 "success" and will do so again this year if they hope to top or match a .500 record. PECOTA projects 23-year-old starters Brett Anderson and Trevor Cahill to be sub 4.00 ERA guys and they might be a tick better. I'm less enthusiastic about Gio Gonzalez and Dallas Braden but what do I know. The A's offense is led by... Jose Canseco wants to play baseball again, right? I'm not kidding, I don't know who the A's best hitter is. Is Daric Barton a thing? But I am sponsoring Brandon Wood's Baseball Reference page, so there's that. I wouldn't be surprised if they can outhit the A's for second place in the division but I think a return to the playoffs is a year away. Felix Hernandez won the Cy Young. And I'm spent. Dustin Ackley will spend some time in AAA to start 2011 but shouldn't be there too long. 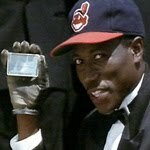 And Michael Pineda looks like a future ace so there is help on the way for the M's. My boy Chone Figgins can't possibly have a worse year than last season unless it turns out that he's actually terrible at baseball. Same thing goes for Justin Smoak. Aside from King Felix, the best thing about the Mariners last season was watching Franklin Gutierrez play center field. We start with the NL East, home of the reigning champion Phillies, wild card Braves, and the other three teams. The Phils, who lost in the NLCS to the eventual champion Giants, already had Roy Halliday, Roy Oswalt and Cole Hamels, but they added some bum named Cliff Lee and now everyone from Jim down the street to that other guy are predicting Philly to go 161-1 (September loss to the Astros in a classic trap game). Oh, and they also have Joe Blanton in the rotation. You know the old saying: if Joe Blanton is your No. 5 starter, you'd better have four good pitchers in front of him. The Phillies do. And despite the knee problems for MTD's boyfriend Chase Utley, they should have enough offense with Ryan Howard, whose averaged 46 HR the past five seasons despite a down 2010 season, and....ummm, Raul Ibanez? OK, so maybe they won't have enough offense, but with that pitching it may not matter. There's a new era in Atlanta. No, the Hawks didn't go through with John Koncak Bobblehead Night after all. The Braves are going into a season with someone other than Bobby Cox as manager for the first time since 1989. The Wobbly One retired after taking Atlanta to the playoffs 15 times in 20 seasons. Big adult diapers to fill for Fredi Gonzalez, who used to be a Braves coach and recently was fired as Marlins manager by shortstop Hanley Ramirez. If it wasn't for the Phils rotation, we'd be talking about Atlanta's being the best in the East with Tommy Hanson, Tim Hudson, Jair Jurrjens and Derek Lowe forming a solid quartet. Atlanta has always moved top-Minor League talent to the majors whenever it is ready and 2010 NL ROY runner-up Jason Heyward will be joined this season by top prospect Freddie Freeman, a 2007 second-round draft pick who will play first base. The Braves also added second baseman Dan Uggla (hit at least 31 HR in four straight seasons) from the Marlins in a November trade, and the latest out of spring camp reported Chipper Jones will be brought to home plate in 2011 by-wheelbarrow. * Will Javy Vazquez, formerly a terrible pitcher (again) with the Yankees, return to his I Only Pitch Well In The NL form? Does anyone even care? 1. Up until Monday they still employed Oliver Perez and gave him $24 million the last two seasons while he was arguably the worst pitcher in baseball. They'll give him $12 million this season to work at the Chevron down the street from my apartment (speculation). 2. They gave Luis Castillo (career OPS+ of 92) nearly $19 million from '08-'10 and will give him $6 million this season to play for the Phillies. 6. They let Jeff Francoeur and his .293 on-base percentage come to the plate 447 times last season. No Stephen Strasburg. No Bryce Harper. But wait just a minute: the Nats signed Oliver Perez to a minor league contract! While Strasburg recovers from Tommy John and Harper bides his time in the minors (Offbase predicts a September call up), the Nats will hope their offense, led by Ryan Zimmerman (5.2 and 5.3 WAR the last two seasons) and new signee Jason Werth (7 years, $122 million!) can score enough runs to stay out of the cellar. Washington will also have to replace Adam Dunn, who hit 76 home runs and walked 193 times in two seasons in the nation's capital. And don't forget Roger Bernadina. He's on the roster too. 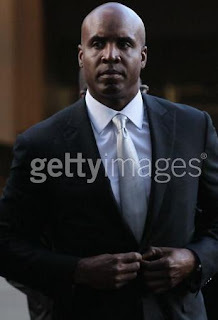 The New York Times reports that eight women and four men were selected to be jurors for Bonds' perjury trial, which had been scheduled to start more than two years ago. But an appeal over evidence and subsequent motions set the start date back, and Bonds, baseball's all-time home run leader, now faces four charges of lying under oath and one count of obstructing justice. He pleaded not guilty to the charges, which he faces as a result of his 2003 grand jury testimony in the BALCO case. The Times reported that group of about 100 potential jurors filled out questionnaires about the case, and 55 were asked to show up at the courthouse Monday. The story said the 12 jurors and two alternates were selected after questioning by lawyers and U.S. district judge Susan Illston. Bonds' trial is expected to last between three and four weeks, according to various reports. I think I'm getting better at journalism. I just blockquoted an entire article from the Toronto Sun about a news report from the New York Times. I'm going to top it off by stealing a picture from Getty Images. He’s a shell of the player Omar Minaya traded for and then signed to a four-year, $25 million deal and the deterioration of Castillo’s once-excellent speed has magnified his career-long lack of power, but last season he drew more walks (39) than strikeouts (25) while posting a .337 on-base percentage that was solidly above the NL average of .328 and got on base at a .366 clip during his entire four-year run with the Mets. Castillo's value is entirely based on his ability to get on base at a decent clip but his days of OBP-ing over .400 are over a decade old now. The signing makes sense for the Phillies since it won't cost them much and fills a now glaring need for depth in the infield. My initial thought, of course, is "OH MY GOD Chase Utley IS DEAD!" The speculation about Utley missing the entire season already had me pretty anxious but now I'm in full blown "refilling my xanax prescription" panic attack mode. I'm not a Phillies fan so the fear of having to replace a projected 4.8 WAR player with a basic replacement level player doesn't bother me so much. But as one of Utley's better known stalkers, I'm quite worried. Apparently my get well basket of HGH infused muffins didn't do the trick. "I wouldn't be surprised if Cano hit 40 home runs," Long said. "He hit 29; could he hit 40? Why not? It's a big number - and not something that's a goal - but could he do it? I don't think there's anybody standing here that thinks he can't." Asked if he thought he could go deep 40 times this season, Cano laughed and answered quickly. "No chance; maybe if you put an extra half-season," Cano said. "To be honest, that's not in my mind. I don't think I'm a home run hitter; most of my home runs are line drives. I don't want that kind of thing in my mind. If I hit it, thank God, but it's not on my mind." Well, PECOTA is more inclined to believe Cano than Long projecting a bit of a regression for the second bagger. It has Cano coming back to Earth a little bit hitting a mere 20 homers and a .300/.346/.476 line which would still make many teams jealous. But if Cano hits 40 bombs, Long needs a raise. If you're wondering why I'm writing a post about a hitting coach, it's because I now have a horse in this race. Brandon Wood reached out to Kevin Long for hitting advice this off season and I recently flushed some cash down a toilet to sponsor his Baseball-Reference page. You might think that after a rough Mardi Gras season that I'd be all alcoholed out by St. Patrick's Day. But you'd be wrong, my friends. I have the day off and plan on spending it accordingly; drinking, watching whatever games MLB.TV allots me and checking in on the NCAA tournament. While St. Paddy's Day is a great excuse to get super hammered on weekday, we must not forget who the real winner is for this ridiculous holiday. That's right, the food coloring industry. Who knows where they'd be without today and Easter. So keep those diligent workers in your thoughts while you're knocking back your sixth pitcher of green Miller's Light. Be safe though kids. We by no means condone drinking and driving and there will be some drunkards on the roads tonight. 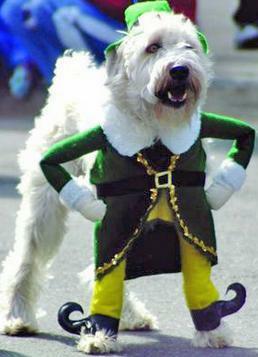 That's why Leprechaun Dog and myself will be staying in and drinking by ourselves. Well that and we have no friends. "All my career I've been throwing to lefties sidearm," Perez said. "This year I'm going to use it more." "He threw strikes," Terry Collins said. "That's what we wanted him to do. He threw strikes, gave them a different look. I thought the 1-2 pitch, he made a real, real good pitch on the outside corner." But before Mets fans get too excited about paying Perez roughly, according to PECOTA, $87,000 an inning, I should probably temper some expectations. That's some pretty bland praise for a seven pitch pop out of Cardinals middling prospect Daniel Descalso. Somebody owes me $5. I told you I could write an entire post about one Spring Training at bat. In between viewing tapes from the 1998 ALCS and the time in 1991 when he singled off one of the kids who had already grown facial hair (shaky camera work by Aunt Jo), Derwood will provide some links from around the baseball blogosphere. We call it Links From Around The Baseball Blogosphere. MLBtraderumors has a post on the oldest $100 million players. I hate three players on that list for various reasons. It'll all be explained in my book "Kevin Brown Just Broke His Hand Punching a Wall and Other Sad Tales of a Yankees Fan Pushed to the Brink", due out in stores July, 2014. (mlbtraderumors.com). Our friends at the Golden Sombrero put together a ridiculous baseball names list. "Ridiculous" and "baseball" next to each other in a sentence is why our site exists; it's also why we get along so well with TGS. (thegoldensombrero.com). Jays Journal wonders whether Toronto will retire Robbie Alomar's No. 12 this season. (Jays Journal). Baseball Reference has a list of youngest opening day starters, which includes Jose Oqeundo and Butch Wynegar! (BR). This should make MTD nice and horrified: Halos Heaven takes a look at which Angels players have worn the jersey No. 19. Scott Kazmir makes an appearance, as does Merritt Ranew. (Halos Heaven). Pops Derwood is practically a celebrity in his living room, so we've asked him to bring that fame and a .205 career batting average to Offbase and share a story or two about his illustrious career in the Chicago Cubs organization. His book, I Didn't See That Fast Ball, But I Heard It, is not scheduled for release until January, 2012, but here is an excerpt. It’s not like I was signed for my hitting. In fact, the year I was signed out of college, 1970, I hit .200 at Springfield College (it might actually have been lower, but in those days, thank god, they didn’t keep good stats). 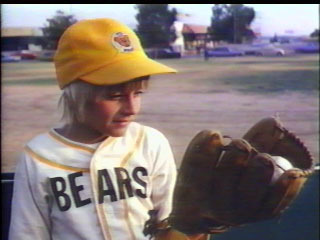 No, I was signed as a catcher-a damn good catcher with a cannon for an arm (nobody stole a base on me). I could catch anybody, called a good game and nothing got by me. But Spring Training in 1971 showed me a whole different world. There, still on the Rookie-A ball roster (after playing on that team the year before), I was catching a Class-AA game because they needed a catcher (this was common in Spring Training. I also caught Fergie Jenkins in the bullpen one day). We were playing the A’s and low and behold the pitcher that day was Vida Blue. THE Vida Blue who was obviously down there getting some work in. I batted eighth of course (no DH in those days) and didn’t expect to actually face him because I figured he would throw a couple of innings, strike out the side in both and move on. But we got a couple of guys on base and I did end up facing him with two outs in the third inning. I actually wasn’t nervous. In fact, you're a lot safer with a Major League pitcher throwing because most of the time they can put it where they want it and had no interest in knocking down a .175 hitter from A ball. So no, I wasn’t nervous. But I was anxious. After all, I had faced Pete Broberg in college who threw in the high 90’s, and I caught Tommy Badcock in college and the pros who had a 90 mile an hour slider. I had seen speed. First pitch from Blue was a fast ball right down the pipe. I took it. Second pitch was on the outside corner and called a strike. I never even saw the damn thing. I mean, I didn’t SEE it as it went by me and landed in the catcher’s glove. Third pitch, same thing-100 million miles an hour and I never even saw the thing. Three pitches and I only saw one of them. “So THAT’S the difference between the minors and the majors,” I thought. Then I realized he could have killed me. If he had thrown at my coconut I never would have seen it! It would have beaned me before I knew I was being beaned. Slowly (but not too slowly) I walked back to the dugout. I began to calculate how many credits I needed to graduate from college because I was pretty sure this was going to be it for me.